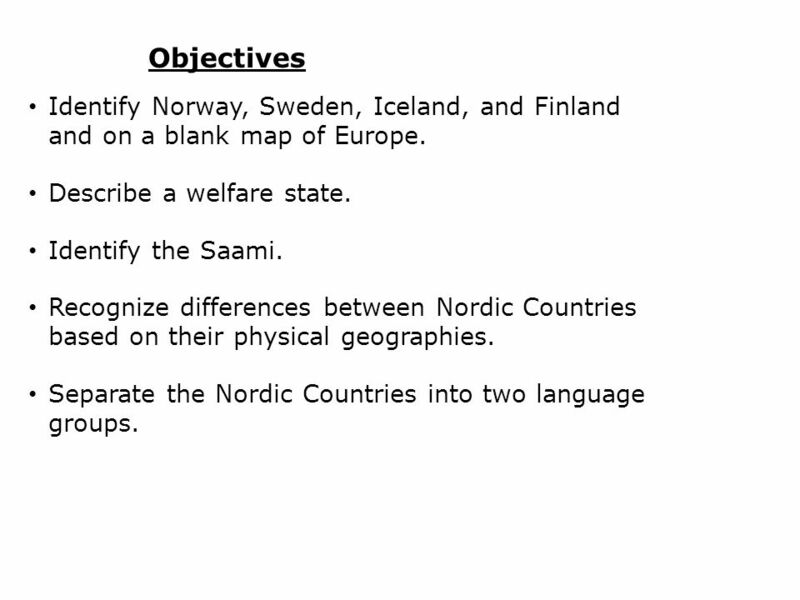 2 Objectives Identify Norway, Sweden, Iceland, and Finland and on a blank map of Europe. Describe a welfare state. Identify the Saami. 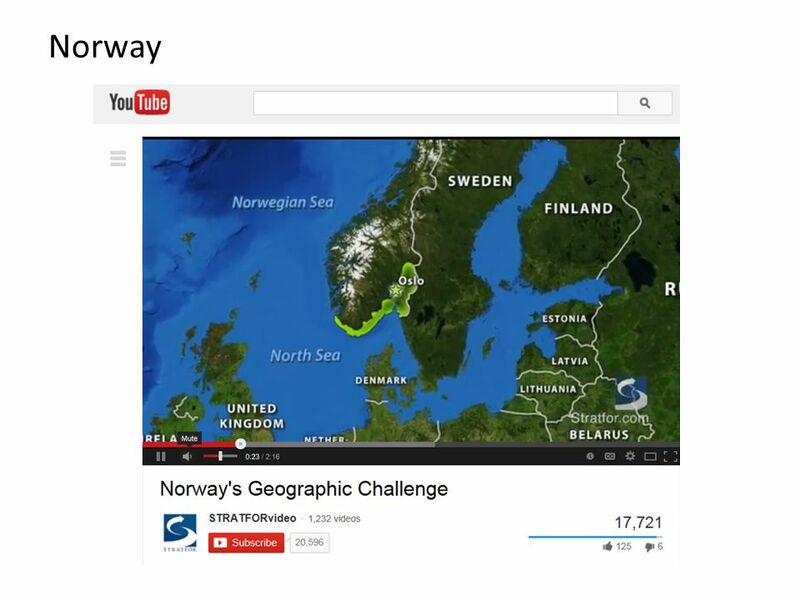 Recognize differences between Nordic Countries based on their physical geographies. 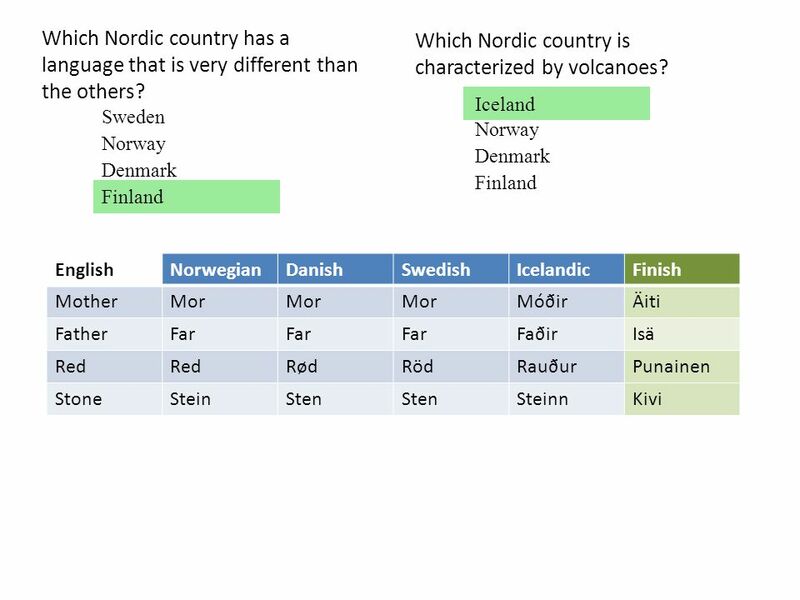 Separate the Nordic Countries into two language groups. 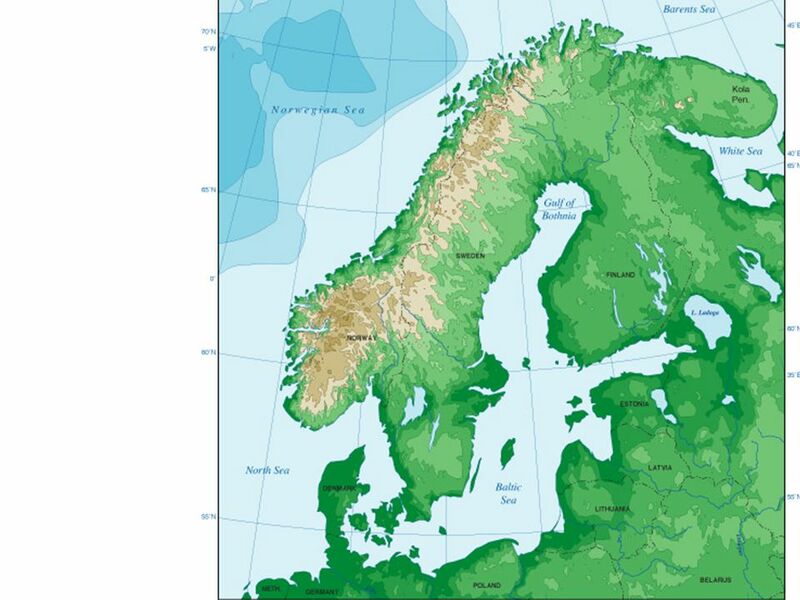 3 Scandinavian Peninsula is a large peninsula in the north of Europe. 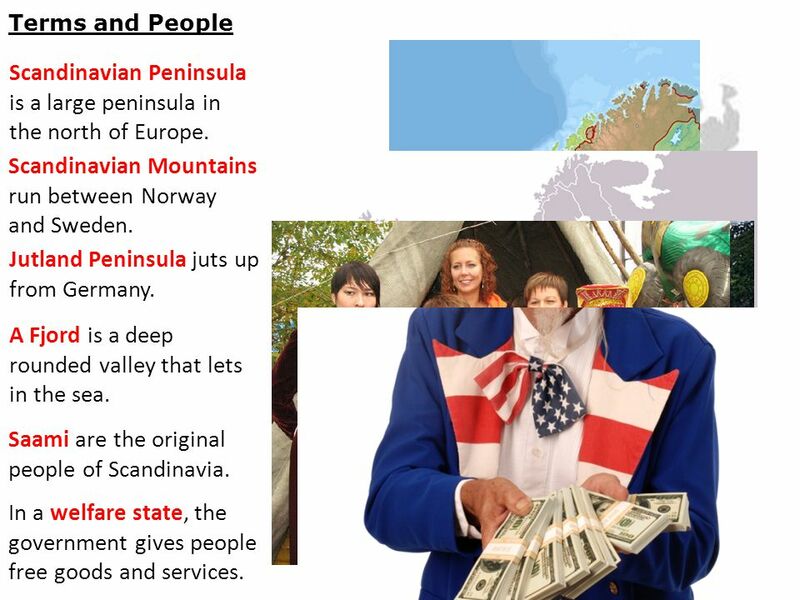 Terms and People Scandinavian Peninsula is a large peninsula in the north of Europe. 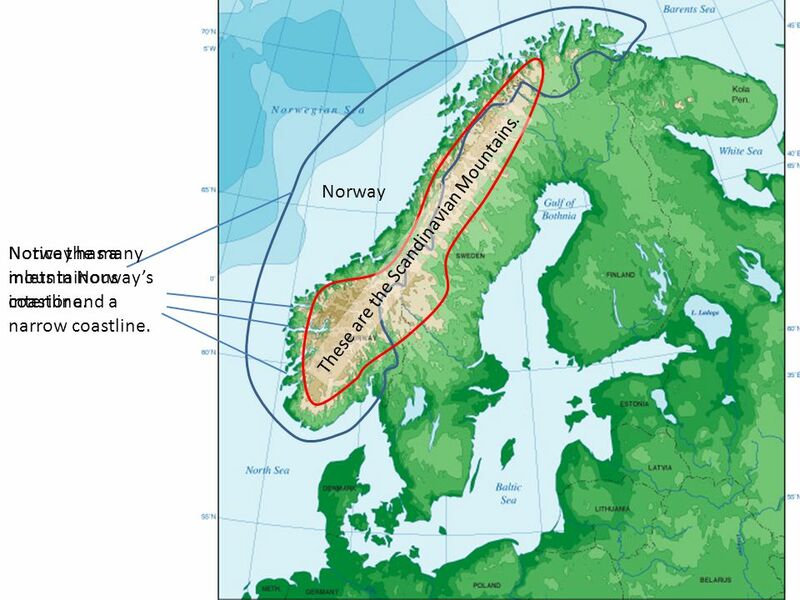 Scandinavian Mountains run between Norway and Sweden. Jutland Peninsula juts up from Germany. A Fjord is a deep rounded valley that lets in the sea. Saami are the original people of Scandinavia. In a welfare state, the government gives people free goods and services. 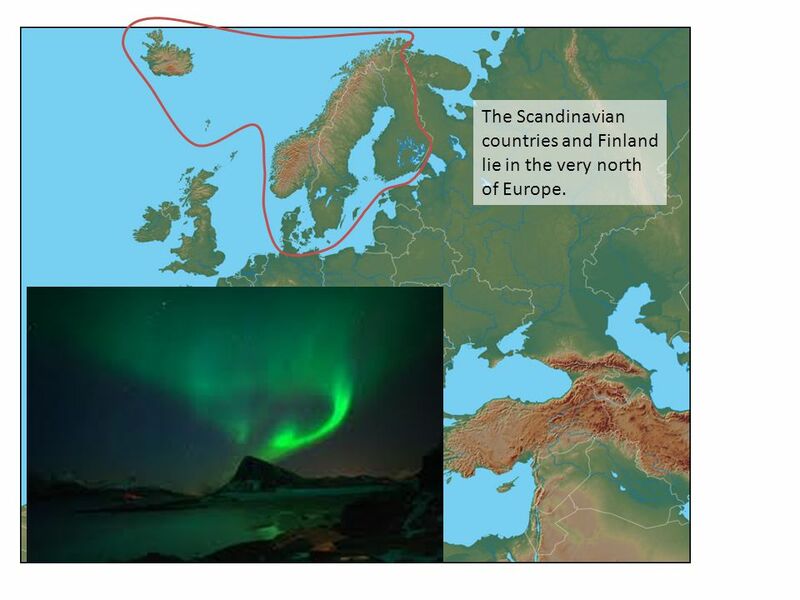 4 The Scandinavian countries and Finland lie in the very north of Europe. 5 Physical Features These are the Scandinavian Mountains. This is the Scandinavian Peninsula. These are the Scandinavian Mountains. This is the Jutland Peninsula. 6 Five nations exist in this area. Iceland is a volcanic island in the North Atlantic. Norway Sweden Five nations exist in this area. Norway has a mountainous interior and a narrow coastline. 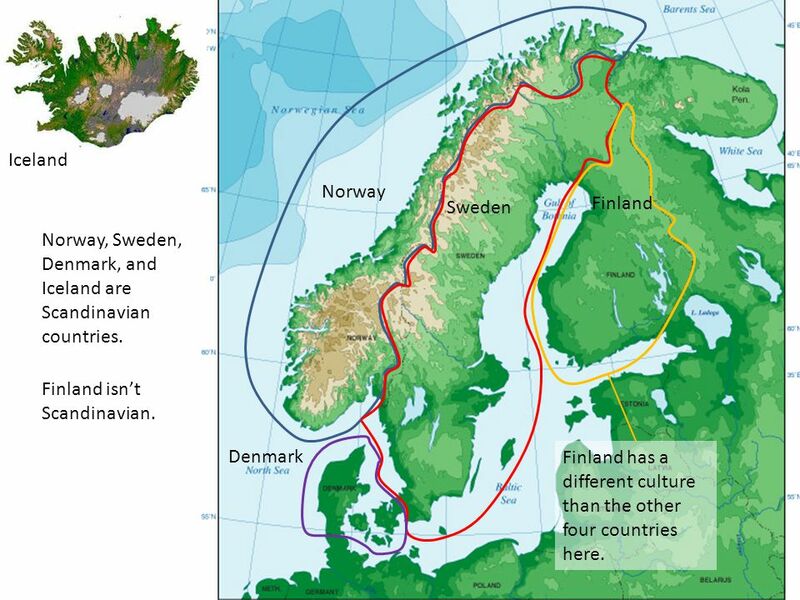 Sweden has more lowlands than Norway. There are forests and swamps. Denmark Denmark is not part of the Scandinavian Peninsula. It’s attached to Germany. 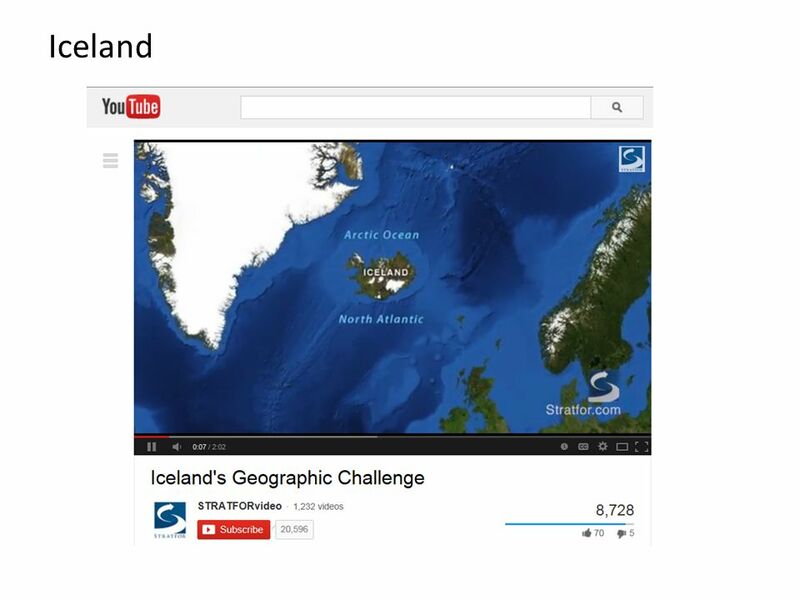 7 Iceland Norway Sweden Finland Norway, Sweden, Denmark, and Iceland are Scandinavian countries. Finland isn’t Scandinavian. Denmark Finland has a different culture than the other four countries here. 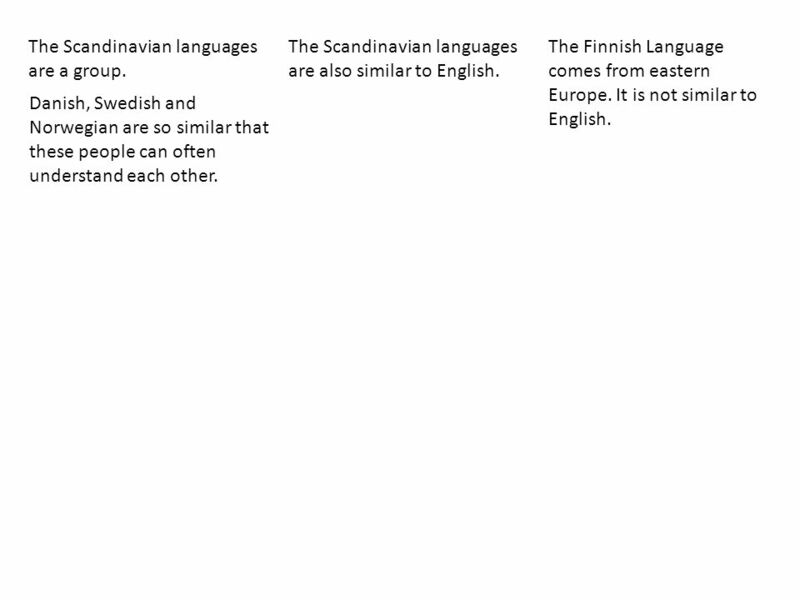 9 The Scandinavian languages are a group. 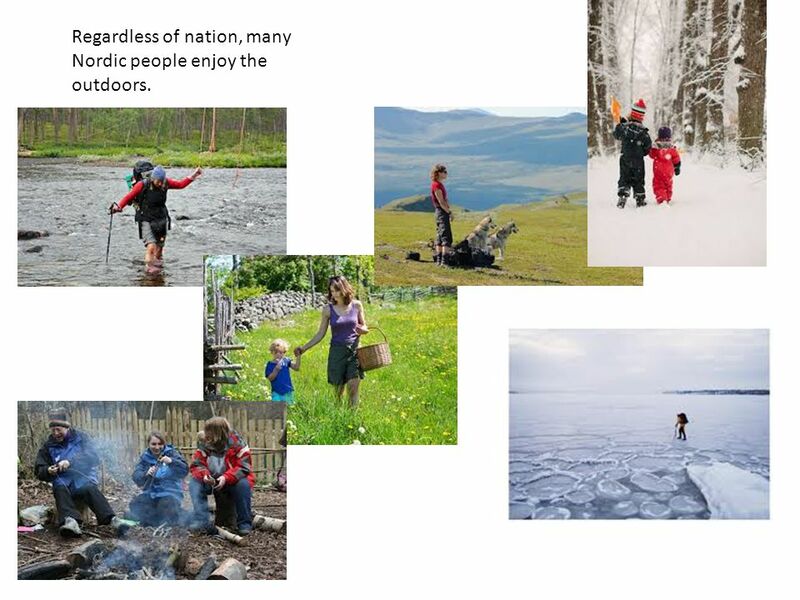 10 Regardless of nation, many Nordic people enjoy the outdoors. 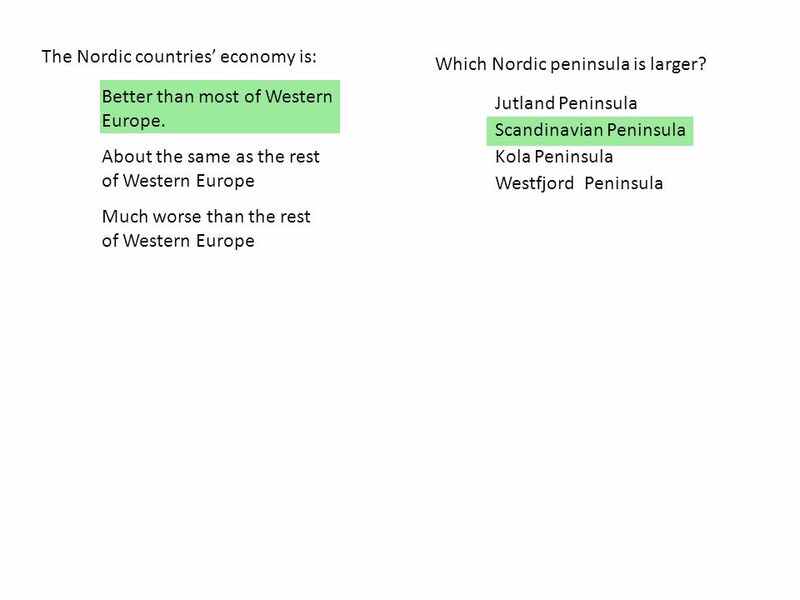 11 How does the population of the Nordic Countries compare to the rest of Europe? 13 Norway These are the Scandinavian Mountains. Notice the many inlets in Norway’s coastline. Norway has a mountainous interior and a narrow coastline. 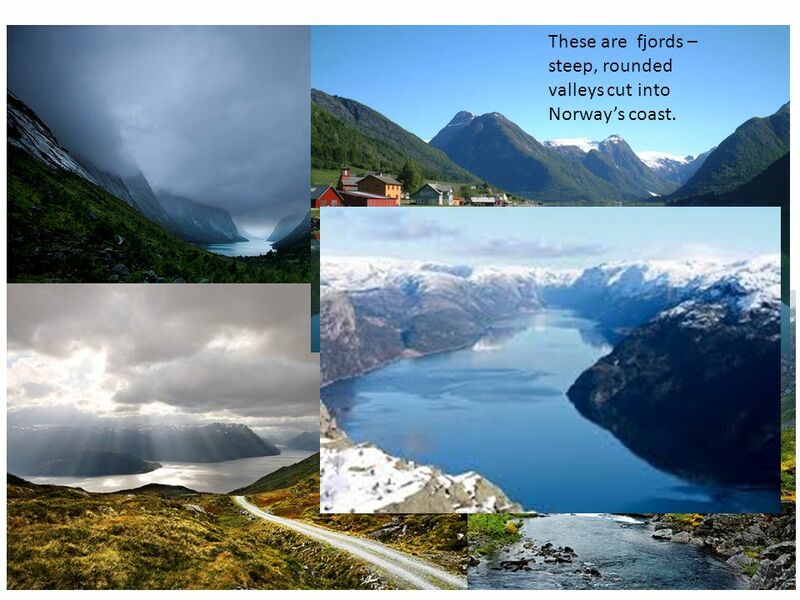 14 These are fjords –steep, rounded valleys cut into Norway’s coast. 16 Sweden Sweden has the largest landmass. 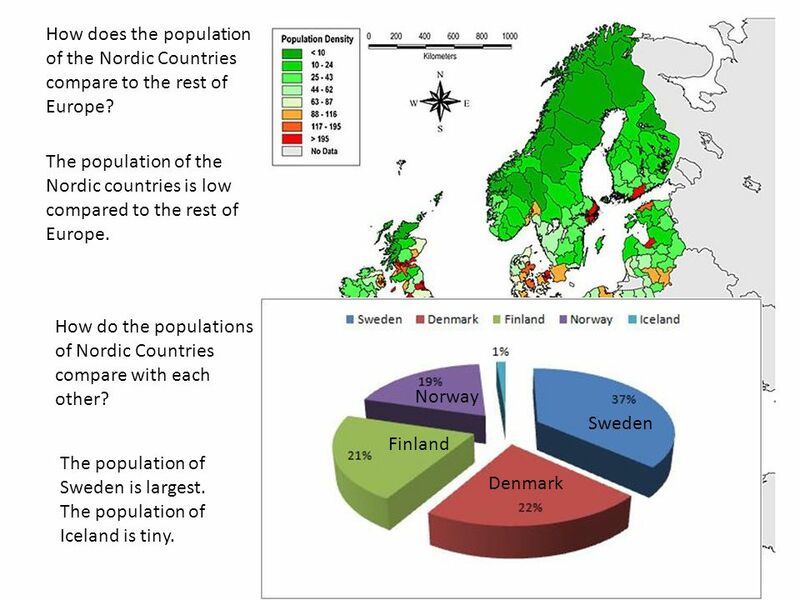 Sweden also has the largest population in the Nordic countries. 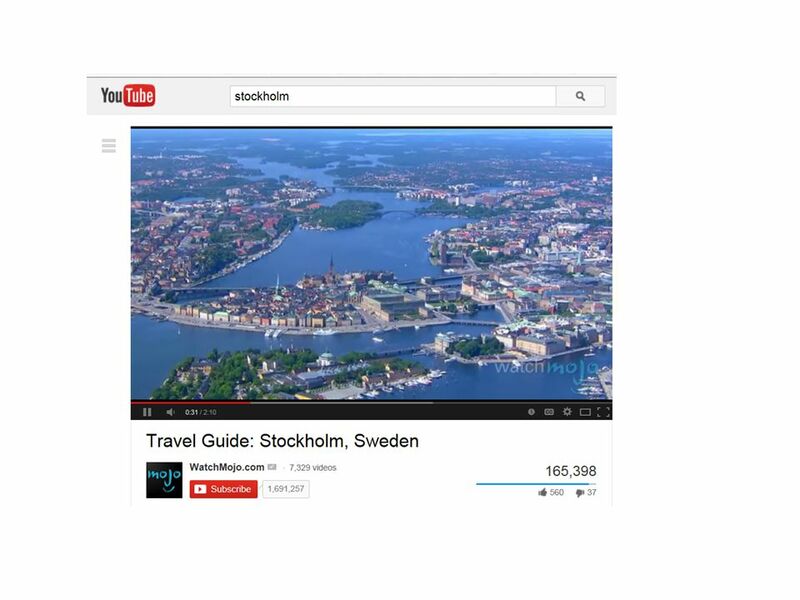 Stockholm, Sweden’s capital is the largest city. Much of it is forests and swamps. 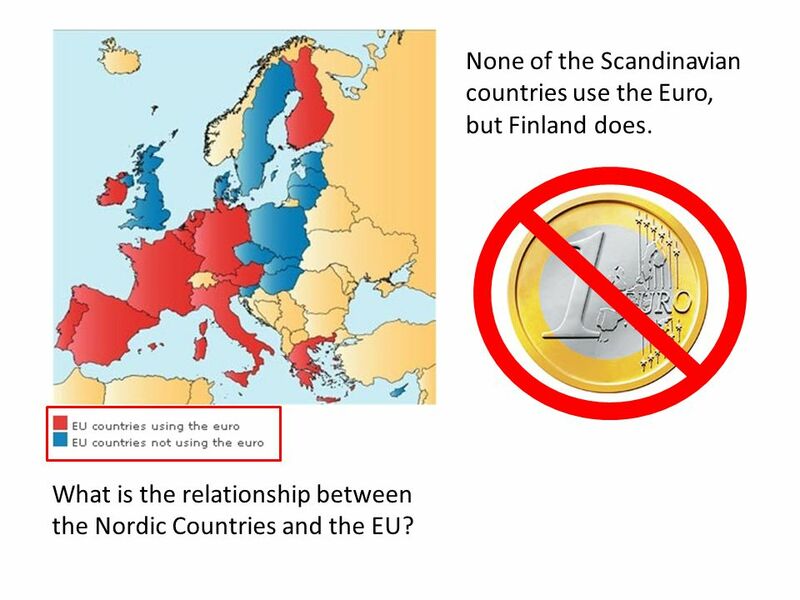 18 None of the Scandinavian countries use the Euro, but Finland does. 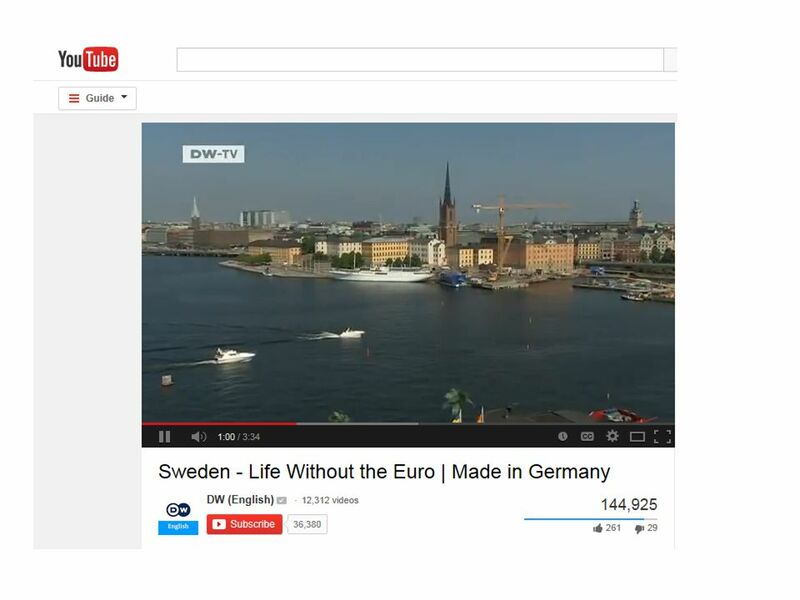 What is the relationship between the Nordic Countries and the EU? 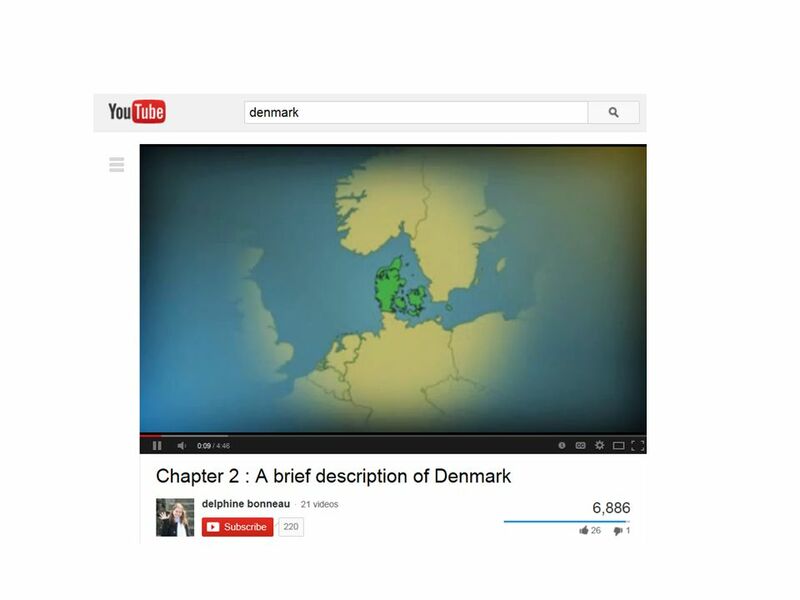 20 Denmark Denmark is a low, flat land with sandy soil. 22 Finland Finland The land of Finland is like Sweden – lots of forests and lots of water. 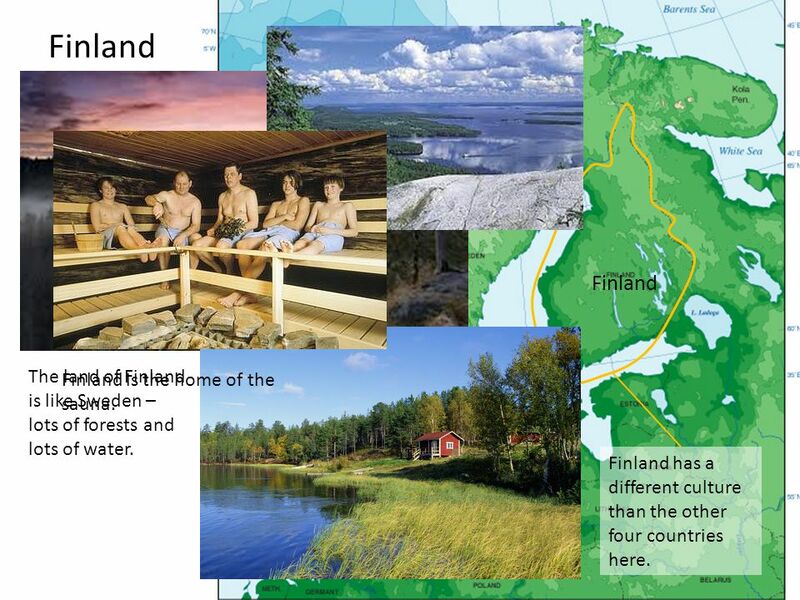 Finland is the home of the sauna. Finland has a different culture than the other four countries here. They enjoy colorful clothing. They herd reindeer. 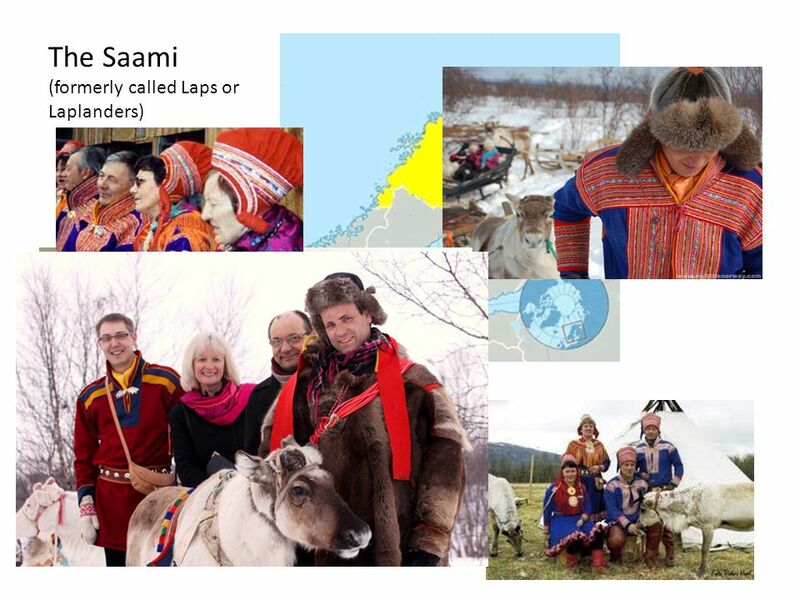 The Saami are a minority group living in the far north. 24 Americans are familiar with many brands that come from the Nordic Countries. 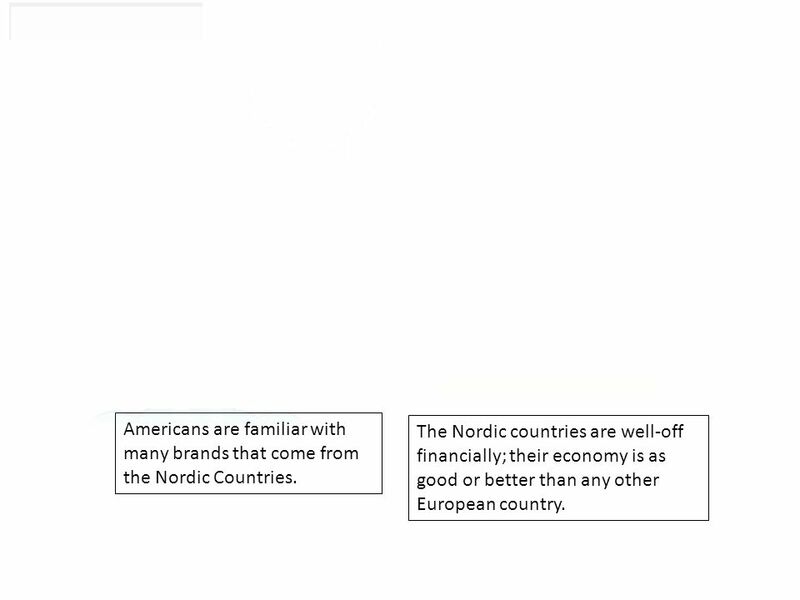 The Nordic countries are well-off financially; their economy is as good or better than any other European country. 26 Which are the Nordic Countries? 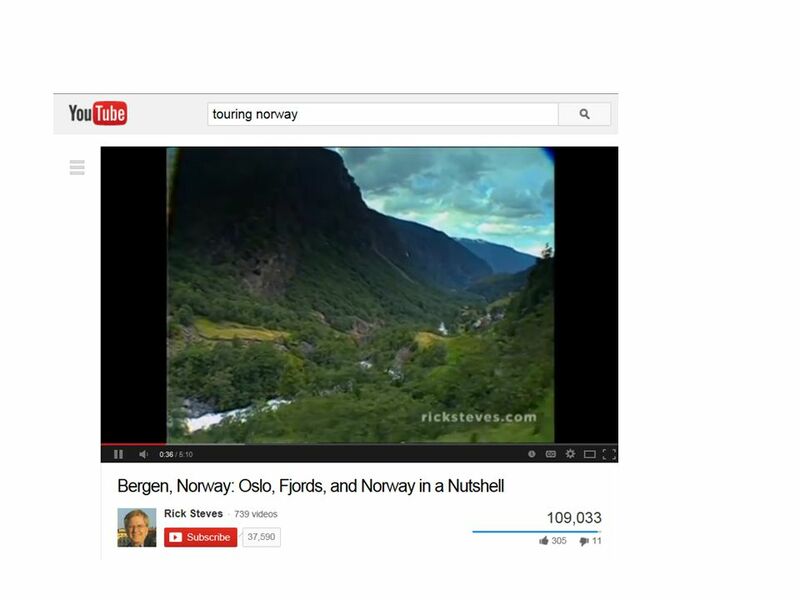 27 Which Nordic country is dominated by mountains? 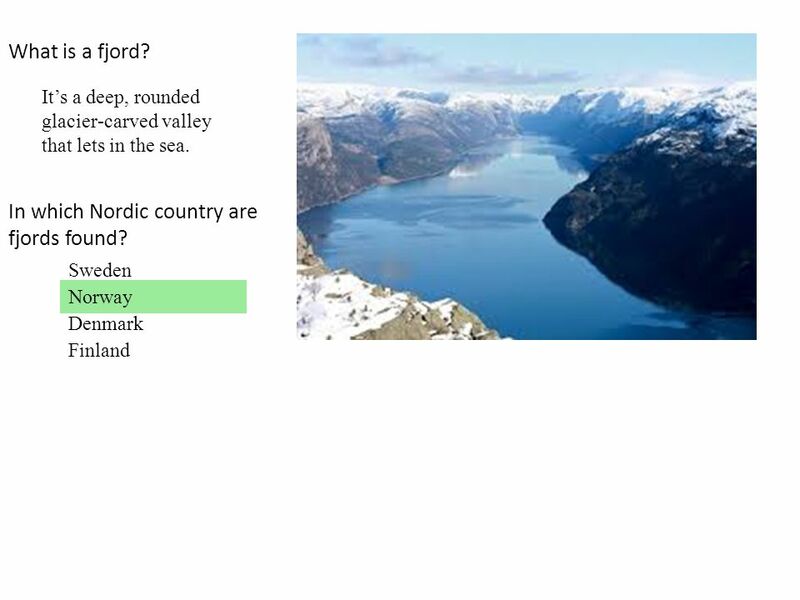 29 In which Nordic country are fjords found? 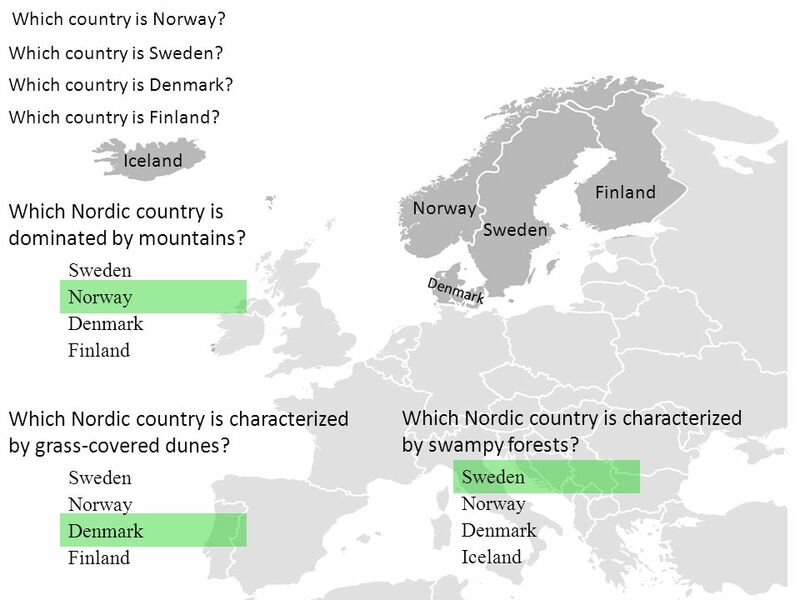 Which Nordic country is the largest in size? Higher than most of Western Europe. 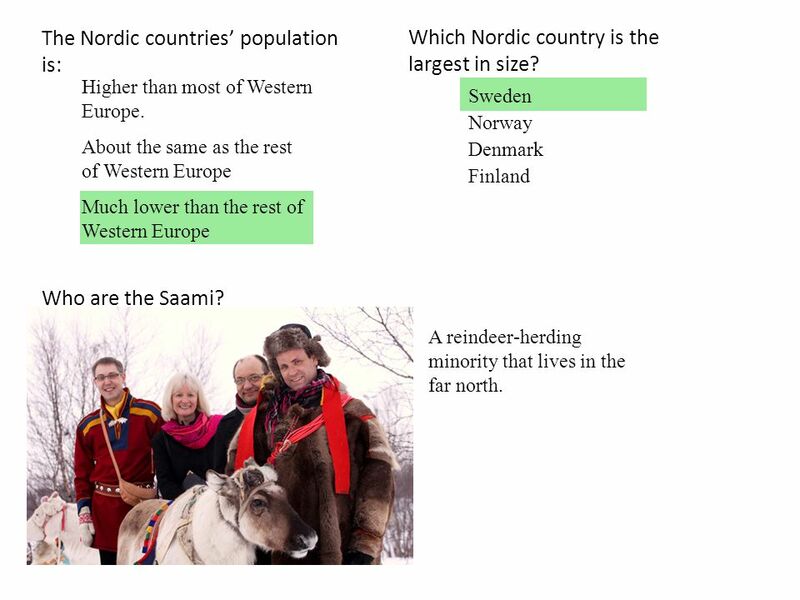 Sweden Norway About the same as the rest of Western Europe Denmark Finland Much lower than the rest of Western Europe Who are the Saami? A reindeer-herding minority that lives in the far north. 31 Which Nordic country is characterized by volcanoes? 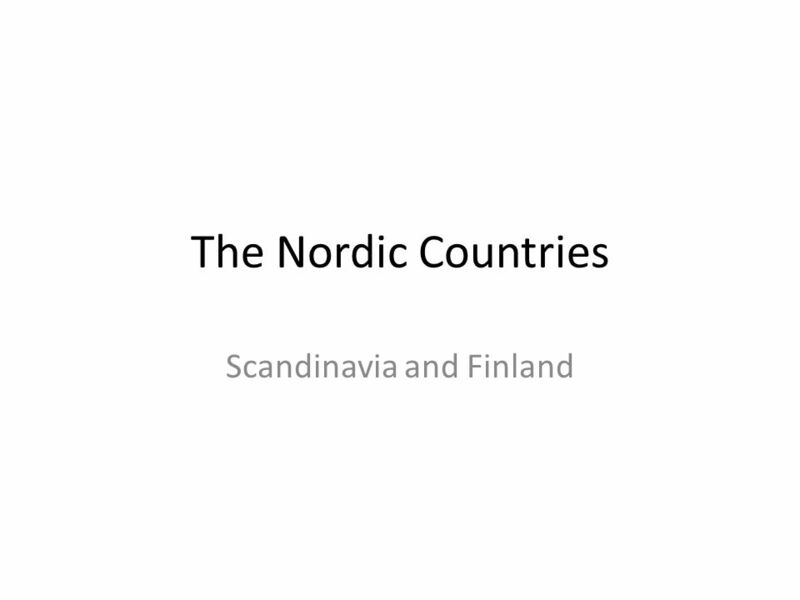 Download ppt "Scandinavia and Finland"
The Nordic Nations. 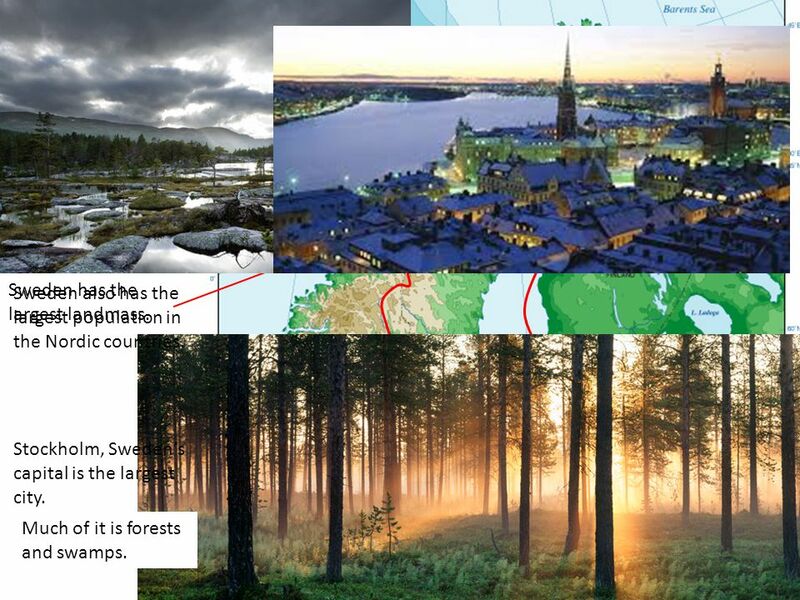 Norway Land of the Midnight sun 1/3 lies north of Arctic Circle Land of the Midnight sun 1/3 lies north of Arctic Circle Climate mostly. 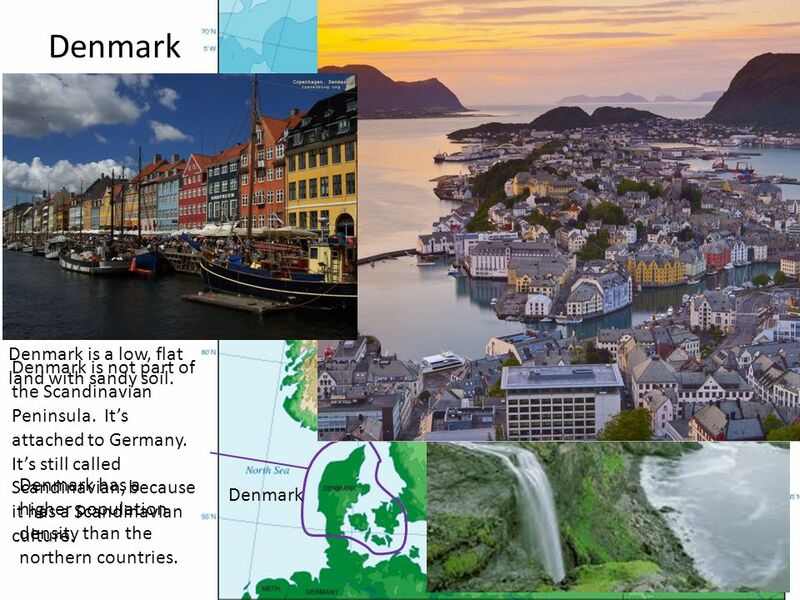 Main Idea 1: The physical features of Northern Europe include low mountain ranges and jagged coastlines. 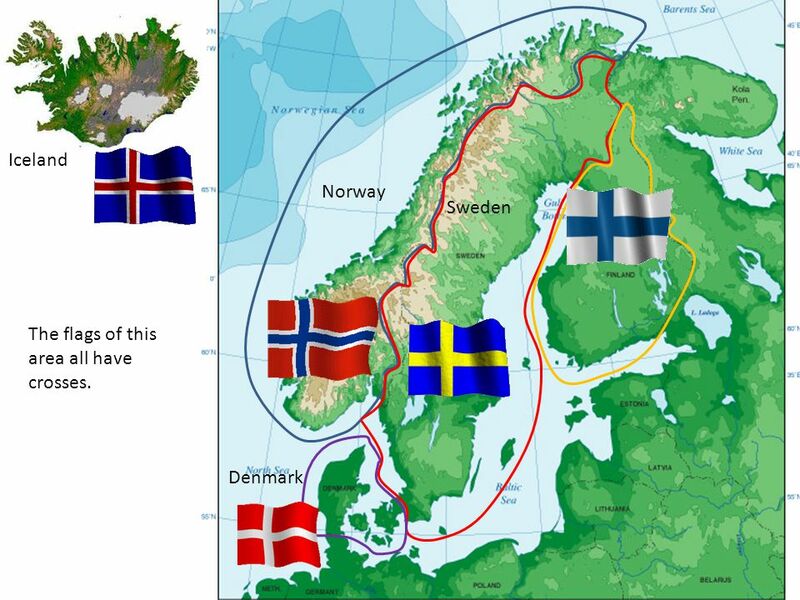 Two regions make up Northern Europe. –British. Which country is the largest country in the world? On the Baltic Sea Estonia, Latvia, Lithuania, and Poland. 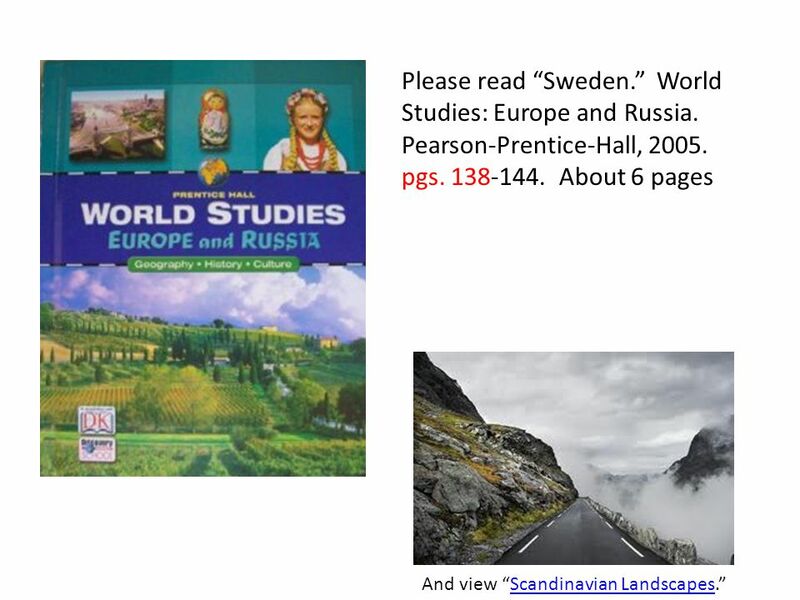 European Geography World Studies. Europe  Europe - located on landmass called Eurasia  Europe is peninsula = body of land surrounded by water on three. Europe Venice, Italy. 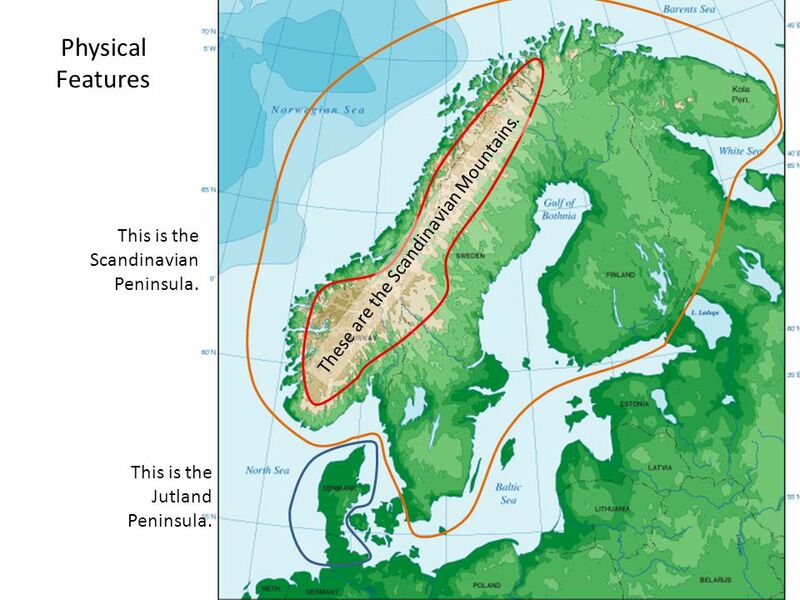 Peninsula of Peninsulas General InformationNorthern Peninsulas  The Scandinavian Peninsula includes Norway and Sweden  -bounded. Warm-Up Which country is the largest country in the world? Russia. MR. GLUCKSON Europe’s Geography. Danube River This river is the second longest river in Europe. Important shipping route across the continent. The Danube. 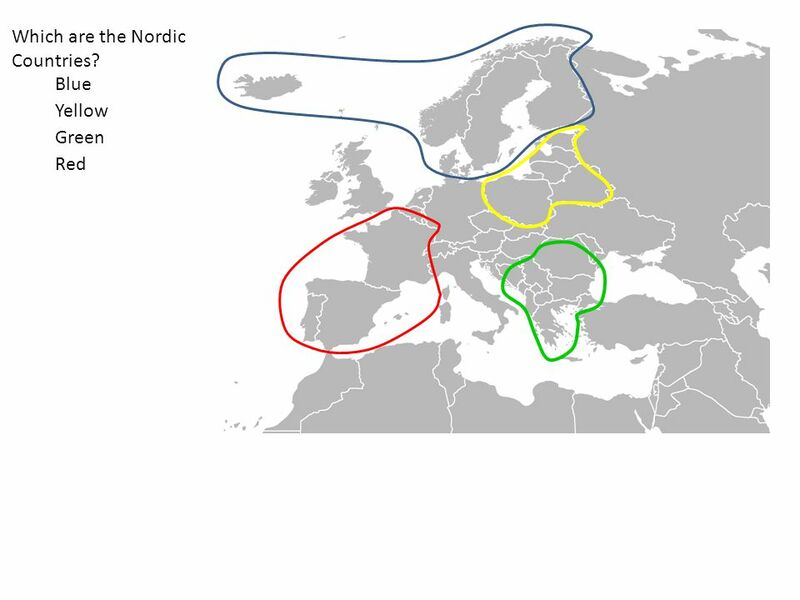 The Nordic Countries Five Nations in Northern Europe make up the Nordic or Scandinavian countries: Sweden, Norway, Finland, Denmark, and Iceland. Western Europe Its Land and Early History. Section 1: A Land of Varied Riches EQ 1: How do you describe Europe’s geography? EQ 2: What factors affect. I have…. Belgium, Netherlands, Luxembourg Who has… One of the most mountainous countries? Europe Physical Geography. The Land Europe is part of a large landmass called Eurasia.